This month has led to many changes for us. We say hello to our two newest chicks, and goodbye to one of our oldest! 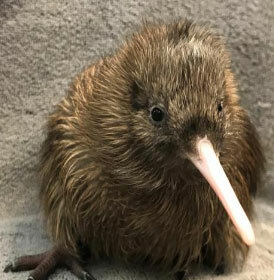 We want to welcome R.EJ1617.2, who we have named ‘Dusk’.This Kiwi chick hatched in the late evening of the 17th of February. A week later, R.DG1617.3, ‘Dawn’ hatched at sunrise on the 24thof February. These two birds are currently on display in our viewing/brooder area, and are doing very well. In a few weeks they will move to our Nocturnal House and become flatmates! Next Next post: HELLO HAAST!